Big money? Creative control? Instant fame? When the dramatic rights to a book are sold, it's important to manage expectations of the deal and the negotiation process. Holly Frederick of Curtis Brown Ltd. literary agency separates fact from fiction when it comes to the film and TV rights to a book. Valerie Peterson: Holly, what can an author expect financially from a film or TV deal? Vast wealth? Holly Frederick: While it would be great if the clients could all be millionaires as a result of their film and television deals, that doesn't usually happen. But the deal does indirectly help the sales of the book, help the book's and the author's profile. For example, here at the Curtis Brown, the minute a film or TV sale is recorded, I let Jonathan Lyons know. He oversees our foreign rights department, and he wants to get the news immediately because foreign publishers love to hear that about a book. Selling the film rights increases the chances of a book—that might not have been picked up otherwise—getting picked up in a foreign translation deal. And, of course, if the project makes it to the screen, it can really positively affect book sales, which is the goal of every author and publisher. Especially with that new movie or TV tie-in cover! VP: Say a director approaches an author about optioning his or her work. What would you tell him or her? HF: Well, for my own Curtis Brown clients, I only option material to experienced producers—producers who have had experience either as an executive working for a company acquiring material or as a producer who develops product and sells it to the studios and the networks. 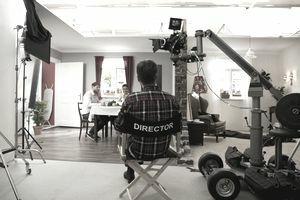 Writers and directors and actors and actresses—there's certainly an added value of having people attached to a project, but the producer's skill set is a really unique one because it's partly creative, but then they have to know where to find financing. Producers have to be aggressive on all different levels—they have to put a team together, and then they have to direct the creative development of the property and then they have to find a buyer, and they have to find money. It's in everybody's best interest that the project gets the best chance of being made and an experienced producer is absolutely critical to that. Those are the people you want to have behind your projects—so I tend not to option material directly to writers and directors. For those other interested parties, I never fully close a door, but I tell them, "Go find a producer, partner up with him or her, and come back to us." We try to make it work best for all parties, but most writers—even the best in the world—aren't inclined to go up with his or her tin cup and say, "Will you finance my movie?" A strong producer is a must. VP: And what about the authors themselves, the ones who want to get involved in the creative process of making their film or television series? HF: It depends on whether the project is being produced by a studio or independently. We were talking about money, so I'll say while I'd love to sell all my books to studios for lots of money, what happens with studios is that a book goes into a studio and sometimes it's just like going into a black hole. The studio says, "Thank you very much" and they shut the door, and there isn't as much opportunity for the author to be involved. You don't hear about anything until 12 or 18 months later when they tell you that the project is moving ahead or they've decided to drop it. On the independent side, without getting granular about the deal-making—because they're all different—I'll say that being produced independently could open up the opportunity, if the author chooses, to adapt his or her own material and play a larger part in the creative process and I would structure the deal accordingly. VP: Say you strike a deal for the dramatic performance rights. How long between the deal and seeing the book adapted on stage or screen? That is, how long until the author becomes TV or film, ahem, "famous"? HF: I would say that television probably has the shortest period in which you'll know if your project is going to move forward. Stage can be in development for years and years. Both the Young Adult book "The Outsiders" by S.E. Hinton and "Addie Pray" by Joe David Brown (which was the basis for the movie "Paper Moon") have been in development for years—with TV the cycle is just shorter. A TV deal is made, a writer is hired, and then there's just a series of hurdles—the adaptation of a book into a pilot script. If that's good, there's a pilot order, and they shoot a pilot. And that hopefully begets a series order—but you know sooner rather than later whether or not your project is going to make it to the next step. Stage deals take a really long time to do, and the development process in [musical] theater is really lengthy. You have to not only nail down the rights, but you have to pull together a team of creative collaborators including a librettist and a lyricist and a book writer and a director. And then you compose, and you create, and then you have to workshop it, and then you have to find a financier and then book a theater. All these steps take a long time. Film deals are generally somewhere in between, but those time frames can vary widely. Holly Frederick, film and television agent for Curtis Brown Ltd. literary agency in New York City, began her career at the Susan Schulman Literary Agency. For many years she was a development executive for the Academy Award nominated director Alan J. Pakula. She attended Barnard College and the USC School of Cinematic Arts.